Made a last minute reservation traveling through, very friendly. Got all the codes and info we needed over the phone, internet was fast. Concrete site surrounded by gravel, level. Interior roads easy to navigate and we had a pull-thru site, didn't even have to disconnect Jeep. We heard some road noise during the night over our heater. Perfect for what we needed - a place to overnight and plug in while it was snowing! Good Verizon service. We camped at Gaslight Square Mobile Home Park in a Motorhome. We were here for a week, so the daily rate showing is based on the weekly rate of $170. As others have noted, this park is inside a mobile home park, at the front. When you turn into the mobile home park, take the first right, and then the next right will put you into the RV park. When we made our reservations, we were told we had site D-11, which who ever we talked to, told us it was right in front of the office. It wasn't, it was in front of the lounge and bathrooms. We had to ask another camper where the office was. We got in after the office closed, so we called, and they came over and opened the office, checked us in and gave us our packages, that had arrived before us. Overall, great service from the park management. The site and interiors roads are concrete. We had no problems finding the hook ups and getting connected. Cable and satellite TV worked well, as did AT&T cell service. The Wi-Fi worked well, most of the time, and is better then most we have seen at other parks. We found that our site had trees that are really close, and we could not open the awning. We camped at Gaslight Square Mobile Home Park in a Motorhome. The owner lives in the mobile home park. Our GPS said to take Exit 6 off of I-10, but coming west on I-10 there is no Exit 6. There's Exit 6A and 6B. Take Exit 6A. This is a small campground tucked into a corner of a mobile home park. You're right next to the road, so there's quite a bit of traffic noise. The advantage to that though is that you have easy access to the city (El Paso) and to stores. There is also a train nearby. The sites are on level concrete pads with a gravel area for your car and a concrete patio. The bathroom/showers are large and clean. The laundry is also clean and has three washers ($1) and three dryers ($1). We camped at Gaslight Square Mobile Home Park in a Motorhome. 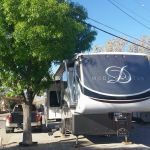 Only rv park on west side of old town El Paso. We were one of two motor homes, others were full timers in 5 Th wheels & older motor homes and campers in a varied state of condition. Park not maintained and located adjacent net to very old manufactured homes in a very sad shape. Office, pool and tennis court in the manufactured home area and no security at night. One night if you are desperate. They had 1 pull thru available, all others filled. Many cars parked about, blue collar area and surrounded by old, Mexican border type businesses and bars will not return. 50 amp power was fine did not look at showers or baths. Bring awnings in at night high winds. Must go south off I-10 about 5 miles and on West side of I-10 for restaurants, shopping, etc....We stayed here as we had a friend living in west El Paso and wanted to be close otherwise would have stayed in East El Paso..... We camped at Gaslight Square Mobile Home Park in a Motorhome. Not a destination park. Neighborhood is fairly run down. The office is located in the surrounding mobile home community, away from the RV area, so we were somewhat confused as to where to go upon arrival. Spots were tight. Utilities and internet were all OK. Were going to stay 2 nights, but didn't feel comfortable so we cut it to one. Would not recommend and will not stay again. We camped at Gaslight Square Mobile Home Park in a Motorhome. Park is in an extremely rundown neighborhood, and there is no park security to prevent unwanted "guests" from walking through the park. Would not feel safe staying here for any length of time, or leaving anything of value outside. Sites are level concrete pads, close together with good hookups. Do to lack of security, did not use the restrooms, showers or laundry room; so can not evaluate the cleanliness of them. Office is only open from 1-4 p.m., so we did not visit the office due to our late arrival. The woman that took our reservation over the phone was very courteous and helpful. Would not recommend this park as a destination vacation, but is ok for a one night visit. We camped at Gaslight Square Mobile Home Park in a Motorhome. We spent 2 nights here and was impressed with the friendliness of the staff, price, great internet, plenty of TV channels and the sites were level. They didn't have a large dog area, but what they did have was clean and they provided bags. I had appointments in El Paso and we chose this one and very glad we did. We would definitely recommend this one in the future and plan on staying here when we return. We camped at Gaslight Square Mobile Home Park in a Motorhome. This park was great while visiting family in El Paso. Not a resort, but the sites were clean and it was very quiet small park. Nice neighbors and there are some long term families living in the park. They were very friendly and helpful. We stayed a month and got the better rate. This is not a resort, but we were satisfied during the month. We camped at Gaslight Square Mobile Home Park in a Motorhome. Our plan was to stay 3 nights. Five minutes after setting up, we decided to make it an over nighter. The RV sites are in a separate area at the front of a mobile home community. Several RV's are permanent or seasonal but appear to be well maintained. The campground is nice enough, absolutely spotless with full hookups, paved roads, paved pads, adequate specs between sites. Cable and Wi-Fi both worked fine. However, the surrounding neighborhood is marginal at best. The din is unnerving. Talbot is a busy arterial. Traffic noise was loud. It seemed 1/4 of the cars going by had boom box stereo systems. A neighbor across the street was tuning his engine and gunning the muffler-less motor. There was also train noise in the background. This place is good for a stop off the interstate, but I wouldn't consider it a "destination". We camped at Gaslight Square Mobile Home Park in a Motorhome.